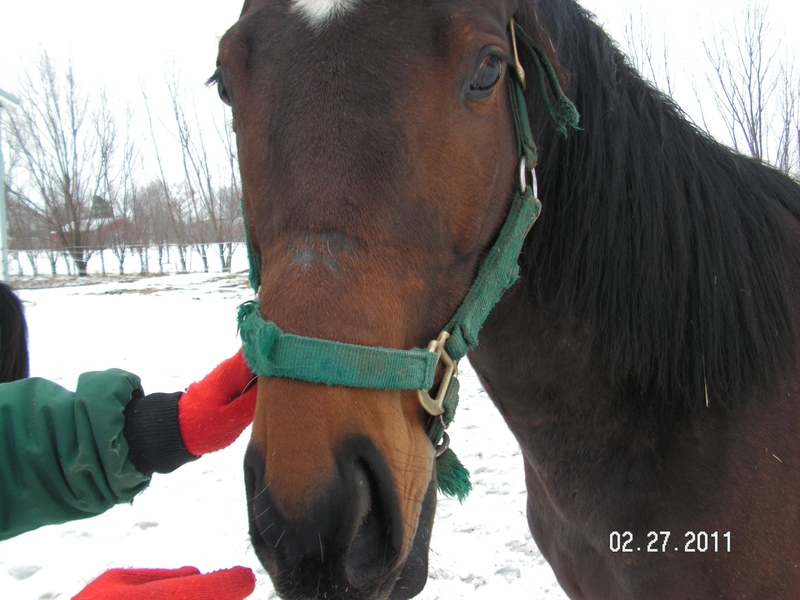 My name is George, I met Allen, Nancy, and Corri from The Healing Barn when some one told them I had never been out of my stall and that I still had my baby halter on. 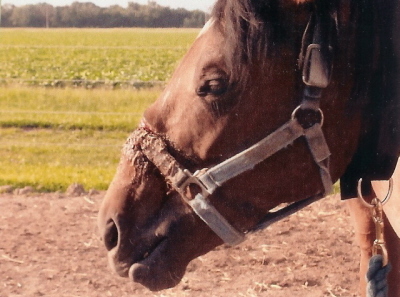 I was a big boy then, and my halter had grown into my skin and I had a bad infection all over my face. I had so much pain, I could not stand for any one to touch me, I was very afraid. I was especially afraid of the outside because I didn’t know what it was. 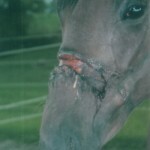 When I came to The Healing Barn I had to go into isolation because I had gang green infection and it was spreading to my eyes, nose, and throat. The burn and pain I felt was very bad. I had drainage coming out of my nose and eyes. Thank God the people from The Healing Barn came and rescued me. As soon as we arrived to the barn I ran like crazy, I had never been outside; Boy was it AMAZING!! I was so excited my halter went flying right off. I can remember within a couple days of arriving at The Healing Barn the vet came out to see me, he gave me some medicine that made me really tired. The next thing I knew I was waking up and my face felt much better!! I believe they cleaned my wound up very well and put some special cream to help it heal. I am learning how to have a saddle on and some day I will have a person to ride me. 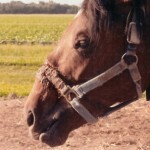 I can’t wait to learn how to ride now that my face is healed. Thank you for reading my story and for caring. His Success and Update: George had a long road to recovery and without the help of Hilton Herbs Echinacea Plus I don’t know that his story would have the same out come. With the help of the herbs to support his immune system while dealing with the horrible infection and a lot of TLC George has made a full physical recovery!! Unfortunately due to the circumstances and situation he gets very afraid when pressure is applied to his face. At this time we have postponed riding George as he would become very afraid and panic during training. 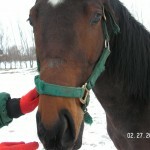 Although George is not broke at this time, he is a wonderful spirit and loves to be brushed and messed with!